Lafayette Parish has a scheduled election for Tuesday, November 6. If you are not currently a registered voter in Lafayette Parish, you can register online, by mail or in person. Louisiana was among the first states to implement an online voter portal. You can register online at any time at the Secretary of State website. Or you can download a voter registration form to fill out and submit by mail. Residents can register in person at their Registrar of Voters Office on the 3rd floor of the Lafayette Parish Government Building. · apply at least 20 days prior to an election if registering online or 30 days prior to an election if registering in person or by mail. To be eligible to vote in the November 6, 2018 election you must be registered prior to the deadline. Voter registration in person closes on October 6, 2018. Online electronic registration must by submitted by October 16, 2018. You can get additional information online about voter registration and upcoming election deadlines. 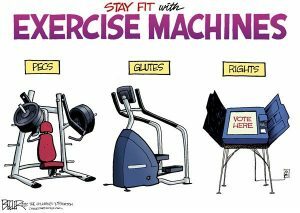 Exercise your rights! Register to vote and make your voice heard. If you need a civil rights attorney, contact the Law Offices of L. Clayton Burgess.